Know exactly what you have done with each of your Contacts. Automatically send emails and be reminded to followup with Contacts. Quickly schedule calls, then make them with our Phone Assistant. Easily create Lead Capture Pages and web forms from scratch. Manage your personal Email and List Mails all in one place. Enjoy scratching the tasks off your list as you complete them. Intuitive calendar as simple to use as the one on your fridge. Hosted software has many benefits over traditional software. Meet the experts whose input helped to create this tool. 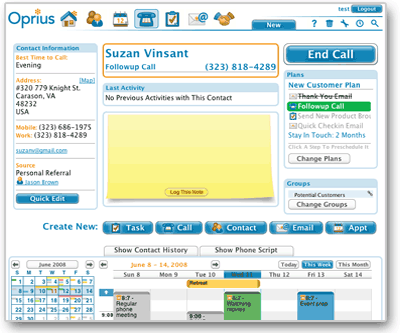 Training resources to help you learn about using Oprius. It's cozy, and full of videos covering everything about Oprius.